Will Central African Republic Peace Deal Last? Will Peace Accord Bring End to Violence? 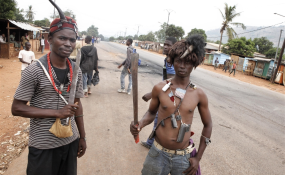 Anti Balaka fighters at Bangui´s estate PK9, waiting to attack Muslim IDPs convoys passing the road (file photo). Bangui/Dakar/New York — Two planes carrying vital supplies for thousands of families displaced by violence in the Central African Republic were finally able to land earlier today in Bangassou, UNICEF said, after weeks of intensified conflict had blocked the delivery of humanitarian assistance to the southeast. "We've been trying to reach thousands of families in dire need of humanitarian assistance for over a week now, but the roads have become far too dangerous because of escalating violence," said Christine Muhigana, UNICEF Representative in Central African Republic. "Given how critical the situation had become in the southeast, the only option was an airlift to get lifesaving supplies to children and families in these hard to reach areas. An estimated 100,000 people have fled their homes in search of safety, in what is the country's largest population displacement since 2014. In Bria, the vast majority of the inhabitants - 40,000 people out of a total population of 47,000 - have already fled, with most of them being children. UNICEF continues to call on all armed groups to give aid workers free and unimpeded access to civilian populations, so that life-saving supplies and services can be provided without delay. UNICEF's humanitarian response for children in the Central African Republic is 30 per cent funded for 2017. Out of US $46.3 million requested, less than US $14 million has been received.